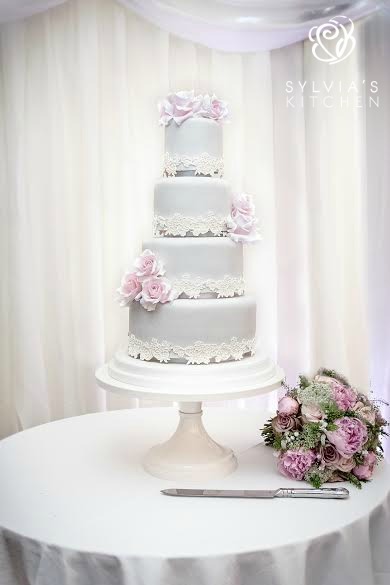 Four tier wedding cake at Broyle Place, Ringmer, East Sussex. Iced in soft pale dove grey and decorated with hand made sugar lace, with a soft pearlised lustre finish and matt hand overpiping. 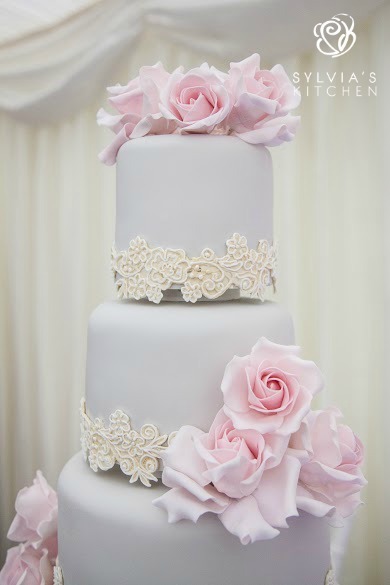 Tiers one two and three finished with pale pink sugar full bloom roses. Base tier of Belgian couverture chocolate cake with whipped Belgian couverture chocolate ganache filling. Tier one of Madagascan vanilla sponge with whipped Madagascan vanilla bean paste buttercream and Raspberry conserve. Tier two of fresh lemon zest sponge with whipped lemoncurd buttercream. Tier three of rich moist fruit cake. Cake serves 130 finger portions. Images by FitzGerald Photographic.